The world was shocked today to find out that the great character actor Alan Rickman had passed away from cancer. Rickman, perhaps, best known for his character-portrayal as "Professor Snape" from the J.K Rowling's Harry Potter franchise, had 40 years experience as an actor, and his work in films made in the United States as well as those made across the pond in Great Britain will continue to introduce this greatly under-rated actor to generations that follow. And yet, Rickman was so much more than Snape from Potter. He had made his career playing a variety of characters, he wasn't type-cast ever, and his range included playing villains to angels and ghosts. Rickman was born in 1946, and early on in his days as an apprentice actor he became a member of the prestigious Royal Shakespeare Company. Rickman even went on to win a Tony Award in 1985. As well as a Golden Globe Award, an Emmy, and SAG award for his performance as the Russian mad monk who could not be killed, "Rasputin." Rickman passed away today at the age of 69. 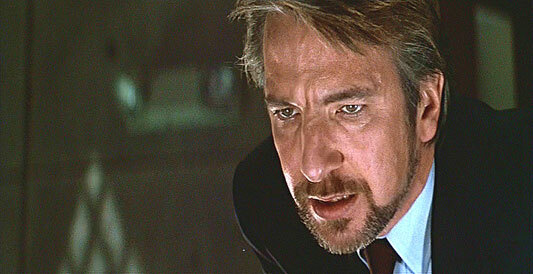 While most of this generation will always remember Rickman in the years to come for his jet-black hair in the part of Professor Snape in the Harry Potter film series, the previous generation will best remember Rickman for his villainous take on "Hans Gruber" in Die Hard. Starring Bruce Willis and Alan Rickman, Rickman as Gruber attempts to take over a corporate high-rise building on Christmas. 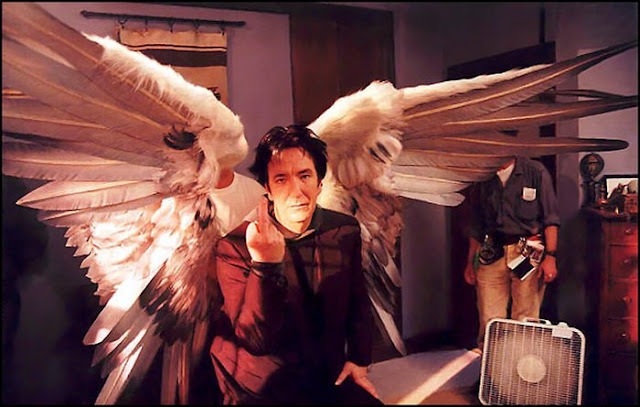 Rickman's performance has become iconic just as well as the film itself today. Fans quote Rickman's lines as well as the mimic the scene with Willis and the dead guy in the elevator. Directed by Anthony Minghella, who most may know as the director of such big Hollywood fare as The English Patient and The Talented Mr. Ripley, Truly, Madly, Deeply finds Alan Rickman as "Jamie" a cellist who has recently died. Morning the death of the lost of her life, "Nina" begins to see the ghost of Jamie. As a ghost Rickman sticks around the love of his life to help her through the grieving process, and in the end leaves when a new man enters into her life. Truly, Madly, Deeply is a masterpiece of beauty, love and might feature Rickman's finest performance as an actor. A movie that completely tanked at the box office on its release but has since developed a loyal fan base that isn't quite cult but almost. 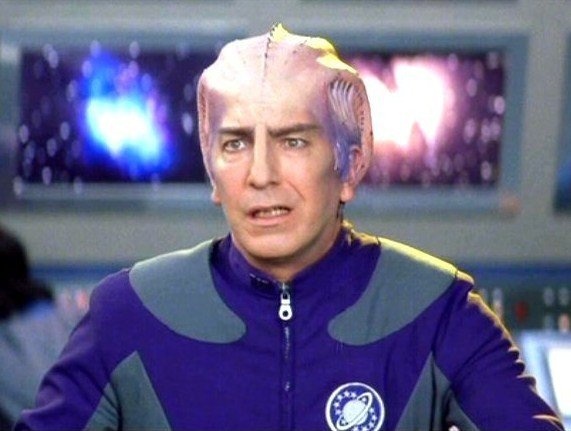 Lampooning Star Trek and other classic science fiction television series of the past, Galaxy Quest features a fictional former science fiction television show cast that actually goes off into space although they do not know that what they are doing is actually real. The film stars Alan Rickman, Tim Allen, Sigourney Weaver, and Tony Shalhoub. Yes, Monk is in it. Rickman plays an alien. It's all around genius. On of the heels of the success of Die Hard and Truly, Madly, Deeply, Rick takes on another villain role in 1991's Robin Hood reboot. 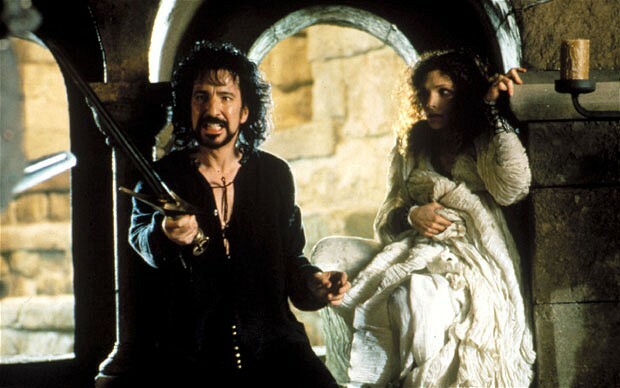 Going up against Kevin Costner, and an over-played Brian Adam's theme song, Rickman brings the Sheriff of Nottingham to life like no other actor had previously. He's a gross, and sleazy Sheriff. A public servant hell-bent on sexing Maid Marian and killing Costner's Robin Hood. It's a great movie. You get Morgan Freeman speaking in a weird accent, Christian Slater with a chip on his shoulder, and a little cameo by James Bond himself, Sean Connery. Directed by fanboy Kevin Smith, Dogma is Smith's first "serious" movie. With an all-star cast that features Alan Rickman, Ben Affleck, Matt Damon, Chris Rock, George Carlin, and Jason Lee the film is a screwball comedy of sorts about Catholicism and the church. The film took a lot of heat prior to it's release, even earning protests against it via the Catholic League. It's one of those movies that you'll ever love it or hate it. There is no in between.